as reduce unplanned maintenance and deferment costs. VpCI's offer an environmentally safe method of treatment with low toxicity and low polluting effects. Unlike corrosion inhibiting systems of the past, many of Cortec® VpCl's do not contain chromates or other heavy metals, nitrites, or chlorinated hydrocarbons. With Cortec® VpCls you can turn the tables on corrosion. With the support of our corrosion scientists, engineers, and testing facility, Cortec® can provide simple, environmentally friendly, cost-effective solutions to corrosion problems. FEATURED IN: Pipe Caps to Protect Stainless Steel Featured in Stainless Steel Magazine! NEWS ALERT: EcoLine® Drilling Rod Grease Featured in New Equipment Digest! FEATURED IN: A Customized Corrosion Solution for Pipe End Protection Featured in IPCM Magazine! FEATURED IN: A Customized Corrosion Solution for Pipe End Protection Featured in Industrial Valve Magazine! FEATURED IN: Corrologic Corrplug Pipe end Protection Featured in Contractor Magazine! FEATURED IN: A Customized Corrosion Solution for Pipe End Protection Featured in Construction Technology Magazine! FEATURED IN: Cortec Provides Customised Corrosion Solution for Pipe end Protection Featured in World Pipelines Magazine! FEATURED IN: A Customized Corrosion Solution for Pipe End Protection Featured in Informed Infrastructure Magazine! FEATURED IN: Cortec Introduces next Generation of Corrosion Inhibiting Fuel Additives Featured in F&L Magazine! FEATURED IN: Easy Protection for Heavy Duty Materials Featured in Australian Pipeliner Magazine! FEATURED IN: Cortec Unveils New Fuel Additives Featured in Tanks and Terminals Magazine! PRODUCT RELEASE: Cortec® Introduces the Next Generation of Corrosion Inhibiting Fuel Additives! FEATURED IN: Decontaminating Soil Using Bioremediation Featured in Process Industry Match Magazine! FEATURED IN: Savcor Product Protects Pipe Ends and Internals Featured in Pipeliner Magazine! FEATURED IN: A Self-Replenishing Corrosion Barrier Featured in World Pipelines Magazine! FEATURED IN: Corrologic CorrCaps and Tube Strips from Cortec Protect Tubulars from Corrosion Featured in Canadian MetalWorking Magazine! FEATURED IN: Refinery Water Treatment Extends Service Life, Increases Efficiency Featured in Oil & Gas Engineering Magazine! FEATURED IN: Cortec's EcoLine® Biodegradable Drilling Rod Grease to Replace Petroleum-Based Counterpart Featured in Tooling Magazine! FEATURED IN: Cortec's EcoLine® Biodegradable Drilling Rod Grease to Replace Petroleum-Based Counterpart Featured in BioBased Magazine! FEATURED IN: Cortec's EcoLine® Biodegradable Drilling Rod Grease to Replace Petroleum-Based Counterpart Featured in Petroleum Magazine! FEATURED IN: New Biodegradable Drilling Rod Grease is Eco-friendly Featured in World Energy Magazine! FEATURED IN: Cortec Introduces New Corrosion Protection Technology Featured in Pipelines International Magazine! FEATURED IN: Patented Gel Filler Designed to Protect Annular Void Spaces Featured in Materials Performance Magazine! FEATURED IN: Cortec Launches System for Corrosion Protection of Tubulars Featured in World Pipelines Magazine! FEATURED IN: Cortec's Corrologic® Vpci® Filler is Transforming the Pipeline Casing Protection Market Featured in Water & Wastewater Magazine! FEATURED IN: Cortec's Patented CorroLogic® VpCI® Filler Featured in EBOM Magazine! FEATURED IN: Cortec's Patented CorroLogic® VpCI® Filler Continues to Transform Pipeline Casing Protection Market Featured in IPCM Magazine! FEATURED IN: Cortec's Patented CorroLogic® VpCI® Filler Continues to Transform Pipeline Casing Protection Market Featured in SMT Magazine! FEATURED IN: Corrosion Inhibitors Featured in Pollution Equipment Magazine! TECHNICAL PAPER: Interactions Between Volatile Corrosion Inhibitors and Cathodic Protection! FEATURED IN: Refinery Water Treatment Extends Service Life, Increases Efficiency Featured in Oil & Gas Magazine! NEWS ALERT: Success of Cortec's CorroLogic® Solutions, Cortec's Distributor Presserv Nominated for Innovative Technology Award! 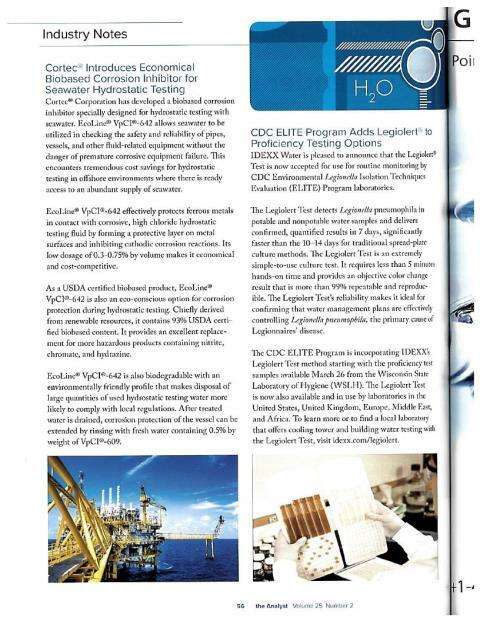 FEATURED IN: Bio-Based Corrosion Inhibitor for Seawater Hydrostatic Testing Featured in Coatings Pro Magazine! FEATURED IN: Cortec® Introduces Eco-Friendly Corrosion Inhibitor for Hydrotesting Featured in Crown Publications! NEWS ALERT: Cortec® VCI Article One of Five Most-Viewed Stories for Oil & Gas Engineering in 2017! PRESS RELEASE: Cortec® VpCI®-649 BD Fights Corrosion, Scale, and Odor in Closed Loop Systems, Pipelines, Tanks, and More! FEATURED IN: Cortec® Introduces EcoLine® VpCI®-642: An Economical Biobased Corrosion Inhibitor for Seawater Hydrostatic Testing Featured in SMT Magazine! FEATURED IN: Cortec® Introduces EcoLine® VpCI®-642: An Economical Biobased Corrosion Inhibitor for Seawater Hydrostatic Testing Featured in IPCM Magazine! FEATURED IN: Cortec® Introduces EcoLine® VpCI®-642: An Economical Biobased Corrosion Inhibitor for Seawater Hydrostatic Testing Featured in AZO Cleantech Magazine! FEATURED IN: Got a Corrosion Headache? Take a Pill! Featured in Australian Pipeliner Magazine! PRESS RELEASE: Cortec® Releases Unique VpCI® Additives Brochure for Fuels, Crude Oil, and Natural Gas! FEATURED IN: Cortec CorShield 352 Coating for Paper Protects Metal Parts Featured in the Fabricator Magazine! FEATURED IN: Corrosion Control Solutions Featured in Inside Oil & Gas Magazine! FEATURED IN: Cortec® Middle East to Present Latest Corrosion Protection Technology in the Oil and Gas Industry Featured in Process Industry Magazine! FEATURED IN: Cortec Middle East Presents Latest Corrosion Protection Technology at ADIPEC Featured in Oil and Gas Engineering Magazine! FEATURED IN: Canada's Pipeline Regulator Revises Quality Programs Featured in Oil and Gas Magazine! FEATURED IN: Practical Approaches to Rigorous Corrosion Protection Featured in Oil and Gas Magazine! 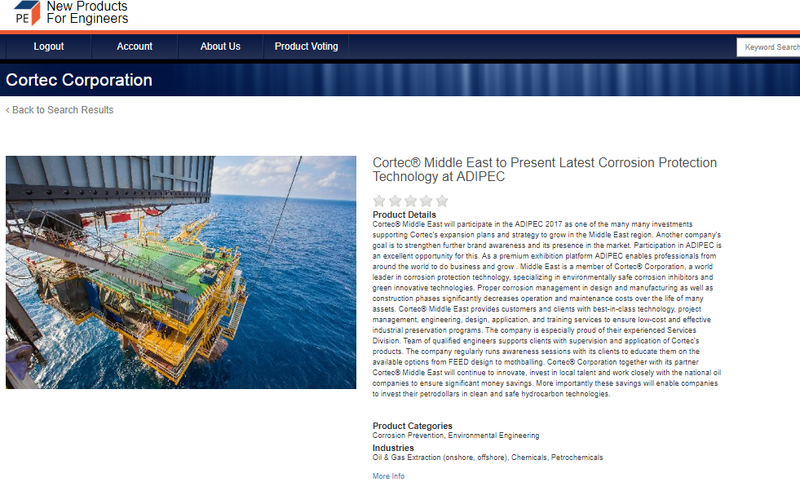 FEATURED IN: Cortec Middle East profile Featured Inside Oil and Gas Magazine! FEATURED IN: Biodegradable Scale and Rust Remover from Cortec Contains 100% USDA Certified Biobased Content Featured in Informed Infrastructure Magazine! FEATURED IN: Biodegradable Scale and Rust Remover from Cortec® Featured in Petroleum Africa Magazine! FEATURED IN: Scale and Rust Remover gets BioPrefferred Certification Featured in Bio Fuels Digest Magazine! FEATURED IN: Biodegradable Scale and Rust Remover from Cortec Featured in Oil and Gas Magazine! FEATURED IN: Protect Against Corrosion - Protecting Your Assets and Profits Featured in Oil & Gas Magazine! FEATURED IN: Corrosion Inhibitors Protecting Your Space Featured in Australian Pipeliner Magazine! FEATURED IN: Combatting the Corrosion Curse Featured in Oil & Gas Magazine! FEATURED IN: VpCI-368 Corrosion-Inhibiting Coating Featured in Oil and Gas Facilities Magazine! FEATURED IN: Cortec® Designs Corrosion Inhibiting Additive Featured in Coatings Journal! FEATURED IN: Cortec ® Designs Corrosion Inhibiting Additive Compatible with Diesel Fuel Tanks and Systems Featured in Process Engineering Magazine! FEATURED IN: Protection for the Future Featured in Australian Pipeliner Magazine! FEATURED IN: Corrosion Inhibitor Enhances Integrity of Platform Caisson Legs Featured in OffShore Magazine! FEATURED IN: Solution to Soil-Side Corrosion on Aboveground Storage Tanks Featured in EP Magazine! FEATURED IN: Protecting Mothballed Facilities From Corrosion Featured in Pipelines Magazine! 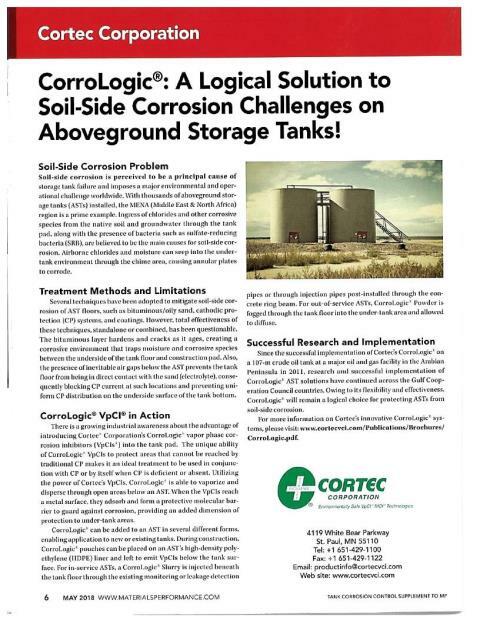 FEATURED IN: Corrologic®: a Logical Solution to Soil-Side Corrosion Challenges on Aboveground Storage Tanks Featured in IPCM Magazine! FEATURED IN: Cortec® EcoLine® 3220 & EcoLine® 3690 Featured in Hydrocarbon Engineering Magazine! FEATURED IN: CorroLogic®: A Logical Solution to Soil-Side Corrosion Challenges on Aboveground Storage Tanks Featured in Electronic Industry Magazine! FEATURED IN: Vapor Tales - Protecting Steel Pipelines Using Vapor Phase Corrosion Inhibitors Featured in Trenchless Technology Magazine! PRESS RELEASE: CorroLogic®: A Logical Solution to Soil-Side Corrosion Challenges on Aboveground Storage Tanks! FEATURED IN: Corrosion Inhibitor Enhances Integrity of Platform Caisson Legs Featured in Offshore Industry Magazine! PRESS RELEASE: Cortec's Exceptional, Environmentally Friendly Pipeline Casing Filler Product is Now Patented! FEATURED IN: Cortec's EcoShield®-386 Featured in Energy Global Magazine! FEATURED IN: Cortec Releases Nano VpCI Powered Rust Remover Featured in IMD Magazine! FEATURED IN: Multi-Phase Corrosion Protection for the Multiple Stages of Gas and Oil Production Featured in Oil and Gas Magazine! FEATURED IN: Save Time and Money with Cortec's EcoClean® Biodegradable Scale and Rust Remover Featured in AZO Materials Magazine! FEATURED IN: Bionetix® Biosurf Uses Nature to Clean Oil Spills Featured in Oil & Gas Magazine! PRODUCT RELEASE: Bionetix&REG; Biosurf Uses Nature to Clean Oil Spills on its Own Surf and Turf! FEATURED IN: Cortec Enhances its Corrosion Inhibitor Featured in World Pipelines Magazine! NEWS ALERT: Protecting Pipelines Using Vapor Phase Corrosion Inhibitors Featured in Oil and Gas Pipelines Magazine! NEWS ALERT: Global Voice in Technical Coatings Solutions Publishes Cortec® VCI Transportation Coatings Article! FEATURED IN: Protecting Pipelines Using Vapor Phase Corrosion Inhibitors Featured in Oil & Gas Pipeline Magazine! FEATURED IN: EcoShield® Nitrite Free Film Powered by Nano-VpCI Featured in Oil and Gas Magazine! FEATURED IN: Cortec® Corporation Conducts Preservation Project on Saadiyat Island Featured in Industry Africa Magazine! FEATURED IN: Cortec® Helps Aging Oil And Gas Structures Featured in Construction Technology Magazine! FEATURED IN: Cortec acquires CorteCros Featured in Energy Global Magazine! FEATURED IN: Cortec's VpCI®-371 Coating Featured in Energy Global Magazine! FEATURED IN: Evaluation of Impressed Current Cathodically Protected Tank Bottoms in the Presence of Vapor Phase Corrosion Inhibitor Featured in Material Performance Magazine! FEATURED IN: Innovative Corrosion Protection That Reduces Manufacturing Costs Featured in Oil & Gas Magazine! FEATURED IN: Cortec to Present Numerous Corrosion Papers at EuroCorr 2016 Featured in World Pipelines Magazine! 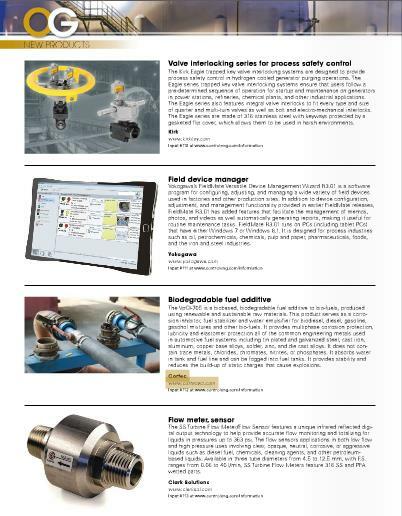 FEATURED IN: Cortec Offers Innovative Critical Spares Solutions Featured in Mechanical Technology Magazine! FEATURED IN: Cortec Offers Innovative Critical Spares Solutions Featured in Scandinavian Oil and Gas Magazine! FEATURED IN: Cortec's Corrosion Prevention Solutions Help Keep Critical Spares Rust Free Featured in AZO Materials Magazine! PRESS RELEASE: Spare a Thought for Critical Spares: Cortec® Offers Innovative Solutions to Global Companies! FEATURED IN: Dalkia Uses VpCI to Protect Saadiyat Chillers Featured in Gulf Construction Magazine! CASE HISTORY: Refinery Equipment Preservation! FEATURED IN: Offshore Platform Caisson Legs Protection Featured in Protective Coatings Magazine! FEATURED IN: Admoc Evaluates Vapour Phase Corrosion Inhibitors Usage Featured in Total Energy Magazine! FEATURED IN: Cortec Corrosion Technology Protects Key Facilities Featured in Gulf Construction Magazine! FEATURED IN: Cortec Expands Corrosion Control Technology to Overseas Energy Markets Featured in Steel Report Magazine! FEATURED IN: Cortec® Helps Aging Oil And Gas Structures In The Middle East Featured in Construction Magazine! FEATURED IN: Cortec Corporation - Preserving Facilities In The Middle East Featured in Oil and Gas Magazine! FEATURED IN: Admoc Evaluates Vapour Phase Corrosion Inhibitors Usage Featured in Energy Info Magazine! FEATURED IN: Preserving Facilities in the Middle East Featured in Oil and Gas Technology Magazine! FEATURED IN: Admoc Adopts Vapour Phase Corrosion Inhibitors Featured in Trade Arabia Magazine! FEATURED IN: Cortec Corporation Announces its VpCI®-643 Featured in World Pipelines Magazine! FEATURED IN: Cortec® Helps Aging Oil And Gas Structures In The Middle East Featured in Processing Industry Magazine! FEATURED IN: Cortec Gives Ageing Structures New Lease of Life Featured in Oil and Gas Technology Magazine! FEATURED IN: Cortec Helps Aging Oil and Gas Structures in the Middle East Featured in World Oil Magazine! FEATURED IN: A Protective Barrier From Corrosion Featured in World of Pipelines - Coatings and Corrosion! FEATURED IN: EcoFog® VpCI®-309 Nano Featured in Gulf Construction Magazine! FEATURED IN: Cortec's "VpCI® Technology for Oil and Gas Industry Brochure Featured in New Equipment Digest! FEATURED IN: Long Term Protection Featured in World Pipelines Magazine! FEATURED IN: Cortec's New Brochure “VpCI Technology For Oil And Gas Industry" Featured in Process Industry Magazine! FEATURED IN: Cortec® Announces Vpci®-643: Environmentally Safe Corrosion Solution for Process Applications Featured in IPCM Magazine! 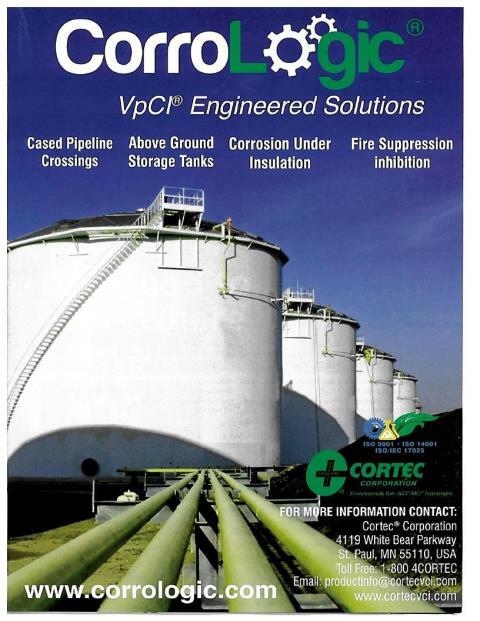 FEATURED IN: Cortec's New Brochure "VpCI® Technology for Oil and Gas Industry" Featured in Engineering News! 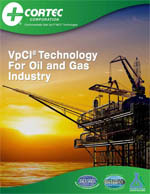 PRESS RELEASE: Cortec's New Brochure "VpCI® Technology for Oil and Gas Industry" Now Available! VpCI® Technology for Oil and Gas Industry!